• Electrochemistry & Battery Technology. • Corrosion & Metal Finishing. • Fuels & Solar energy. • Water Technology & Nano Materials. Electrochemistry: Introduction, Derivation of Nernst equation forelectrode potential. Reference electrodes: Introduction,construction, working and applications of calomel and Ag / AgClelectrodes. Measurement of electrode potential using calomelelectrode. Ion selective electrode: Introduction; Construction andworking of glass electrode, determination of pH using glasselectrode. Concentration cells: Electrolyte concentration cells,numerical problems. Battery Technology: Introduction, classification - primary,secondary and reserve batteries. Characteristics - cell potential,current, capacity, electricitystorage density, energy efficiency, cycle life and shelf life. Construction, working and applications of ZincAir, Nickel- metal hydride batteries. Lithium batteries: Introduction,construction, working and applications of Li-MnO2 and Li-ionbatteries. Corrosion: Introduction, electrochemical theory of corrosion,galvanic series. Factors affecting the rate of corrosion: ratio ofanodic to cathodic areas, nature of metal, nature of corrosionproduct, nature of medium – pH, conductivity, and temperature. process, reformation of petrol, octane and cetane numbers. Gasoline and diesel knocking and their mechanism, antiknocking agents, power alcohol & biodiesel. • Electrochemical and concentration cells. Classical & modern batteriesand fuel cells. • Causes & effects of corrosion of metals and control of corrosion.Modification of surface properties of metals to develop resistance tocorrosion, wear, tear, impact etc. by electroplating and electro lessplating. • Production & consumption of energy for industrialization of country andliving standards of people. Utilization of solar energy for different usefulforms of energy. • Replacement of conventional materials by polymers for variousapplications. • Over viewing of synthesis, properties and applications of nanomaterials. • There will be 2 full questions(with a maximum of four sub questions)from each module. • Each full question will have sub questions covering all the topics under amodule. • The students will have to answer 5 full questions, selecting one fullquestion from each module. 1. B.S.Jai Prakash, R.Venugopal, Sivakumaraiah & Pushpa Iyengar.,“Chemistry for Engineering Students”, Subhash Publications,Bangalore. 2. 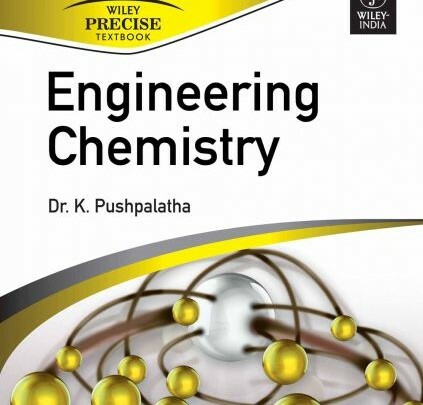 R.V.Gadag & A.Nityananda Shetty., “Engineering Chemistry”, I KInternational Publishing House Private Ltd. New Delhi. 3. P.C.Jain & Monica Jain.,“Engineering Chemistry”, Dhanpat RaiPublications, New Delhi. 1. O.G.Palanna,“Engineering Chemistry”,Tata McGraw Hill Education Pvt. Ltd. New Delhi, Fourth Reprint.